Well, the clues really are in the name, aren't they. Connecting between the M56 and M62? Yes, I figured that out all by myself, thanks. Are you going to be any more helpful, or is this going to be another one of those conversations? The alternative name of "Greater Manchester Western Relief Road" should help give it away. It was proposed in the late 1980s, along with the rest of the "last hurrah" of major roadbuilding projects, in the famed Roads For Prosperity report of 1989, though the details were slowly to emerge over the following couple of years. Traffic levels over the M6 Thelwall Viaduct were growing and although plans for a second bridge (which opened in 1995) were in situ, it was felt that the situation was problematical at best. In addition, the M6/M62 junction at Croft was overloaded, and the M56 in the Manchester Airport area was also suffering severe congestion in peak times. On top of that, motorway access into central Manchester and Salford from the south was (and still is) poor, and needed improvement; as did access to the towns to the north of Manchester such as Bury, Bolton, Rochdale and Oldham - and from there into Yorkshire via the M62 Relief Road. The A556(M) improvement was still kicking around at this point, so one possible route would have been to revisit the earlier M60 proposal for a Altrincham - Sale Bypass, ending on the famous A6144(M). However, if the M60 proposal had been revived, that would have added extra traffic onto the then-M63 Barton Bridge which was again suffering from peak-time delays. The fundamental problem remained: the Manchester Ship Canal only had two high-capacity crossings, both of which were already at capacity. It was therefore decided that the best approach would be a completely new motorway, from the M56 to the M62 relieving both the Thelwall Viaduct and the Barton Bridge - though the question was still where to route the road? There are enough small towns in the study area to make avoiding urban areas difficult, whilst equally the number of small towns meant that the green spaces between them were at a premium. In August 1989, the consultants picked up their pencils, and started work. They decided upon three possible routes, which in the time-honoured fashion they named the ever-so catchy "Red", "Blue" and "Purple". Interestingly, all options included a potential "Carrington Link", a new mostly non-motorway route to link with the A6144(M), which would have been rather boringly turned into a dual carriageway. The proposed A556(M) would provide a motorway link between the M6 and M56. The Yellow route would diverge from the proposed A556(M) near Millington Lane and turn in a northwesterly direction to cross over the M56 where links catering for M56 (west) traffic would be provided. It would cross the A56 Lymm Road, the Bridgewater Canal and the River Bollin in quick succession on embankment. The River Bollin crossing would be west of Dunham Woodhouses. The route would then head towards the A6144 between Mossbrow and Partington. Rising on embankment, it would bridge the Manchester Ship Canal and the A57 between Hollins Green and Cadishead. After falling to ground level north of Hollins Green, the route would cross over the Manchester to Liverpool (Warrington) railway west of Glazebrook. It would then turn in a north easterly direction, cross over Glazebrook Lane and connect with the M62 near Great Woolden Wood. The M62 would be widened from this point eastwards to the junction with the M63 at Eccles. Further detailed work needs to be undertaken before the exact form of widening can be determined, but the current proposal is to widen the motorway to dual four lanes without bringing traffic any closer to built up areas. The plans on display at the exhibitions and on deposit, illustrate one of the options under consideration, which employs the technique known as 'parallel widening'. This enables widening to take place without major disruption to traffic. Throughout the scheme extensive earth mounding, landscaping and planting measures would blend the road into the local environment and offer a measure of protection to those living nearby. The opportunity would also be taken, where possible, to improve upon the existing level of screening for properties already affected by the M62 motorway. In other words, roughly paralleling the M6, though about 4 miles to the east. This route would leave the M6 south of the M56 junction and cross over the M56 west of this junction allowing M56 (west) traffic to join or leave it. It would cross under the A50 and run parallel to the existing M6, rising to cross the A56, the Manchester Ship Canal and the River Mersey on a third Thelwall Viaduct. The route would cross the M6 north of the A57 junction following close to the south-east boundary of Woolston Moss. It would cross over the Manchester to Liverpool (Warrington) railway and meet the M62 at a junction near Great Woolden Wood. The M62 would be widened in an easterly direction as described for the Yellow route. The Orange route was rejected because it was more expensive than the Yellow route and would be a longer route for for majority of traffic. 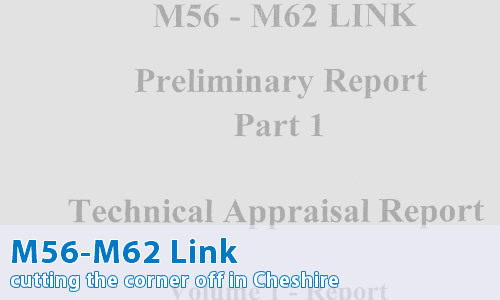 The possibility of widening the M6 to dual 5 lanes between the M56 and A57 was also examined and rejected. This would follow a similar line to the Yellow route from the A556(M) to the River Bollin. It would then head in a north-easterly direction close to ground level, then swing northwesterly between Partington and Carrington Industrial area. After bridging the A6144 Manchester Road, it would turn north-easterly again and follow closely the south bank of the Manchester Ship Canal. Continuing north-east it would pass Carrington Power Station, continue over the River Mersey, under the Liverpool to Manchester railway, pass between the Manchester Ship Canal and Flixton. It would then turn northwards to cross the canal on a long curved viaduct. The route would cross over the A57 Liverpool Road before reaching the M62 in the vicinity of Barton Moss where a junction would be provided. The M62 would be widened as far as the M63 junction. Although the Green route would be shorter route for the majority of the predicted traffic, it would prove to be more expensive then the Yellow route. It was rejected due to its impact on large areas of housing which would be close to the elevated Manchester Ship Canal crossing. A tunnel alternative was considered but rejected on the grounds of affordability. The final route option kind of feels like a "well, we needed another option that wasn't the old M60 ". It weaved its way between the urban areas in a way bound to annoy every single resident - but it was the only route that kept on the potential Carrington Link, which was otherwise dropped. Very detailed - I'm impressed! Wow. High praise indeed! Well, if I mention that two junctions were raised as possibilities, one on the A6144 to the southwest of Partington, and the other on the widened section of M62 near to Barton Aerodrome - though it should be noted that whilst the Ministry said they would include them, it was up to the local authorities in the area to ask nicely and to connect them up. Public exhibitions were held in November 1992, though they might as well not have bothered. In 1993, the Treasury decided that there wasn't any more money stuffed down the back of the Ministerial sofa, and so some of the Roads For Prosperity schemes were starting to be cancelled - and this scheme was one of the first to see the axe fall. It's also one that has never been resurrected in any form - it's very, very firmly dead.